Join KYC in celebrating Canada's 150th with Sailpast and an excellent BBQ hosted by Chef Neil! 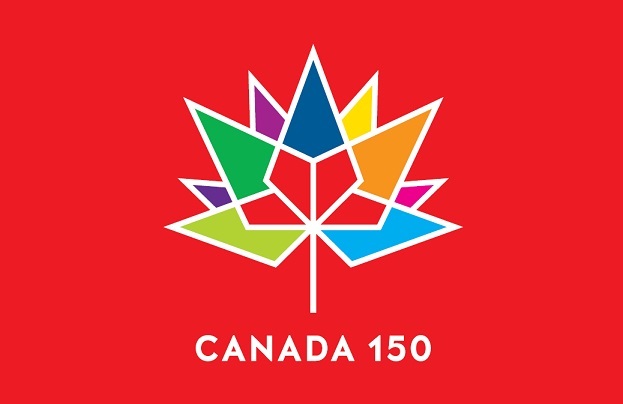 Canada Day 150 is tomorrow!!! 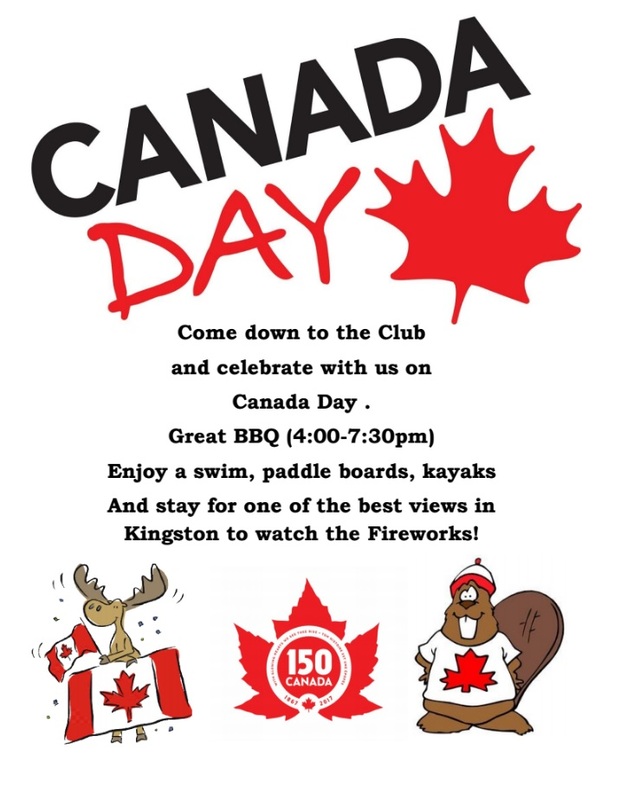 Please join us at the Club for our Annual Canada Day BBQ (4 - 8pm). Then stay & enjoy Kingston's Fireworks from the new centre dock or at the breakwall! Always a great day at the Club. 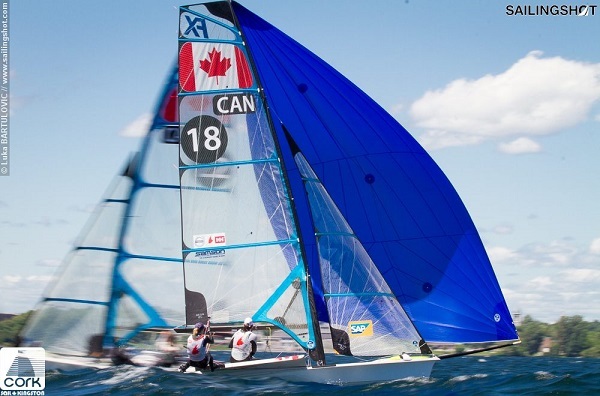 We are will also be participating in Kingston's Canada Day Sailpast! (see poster for additional details). 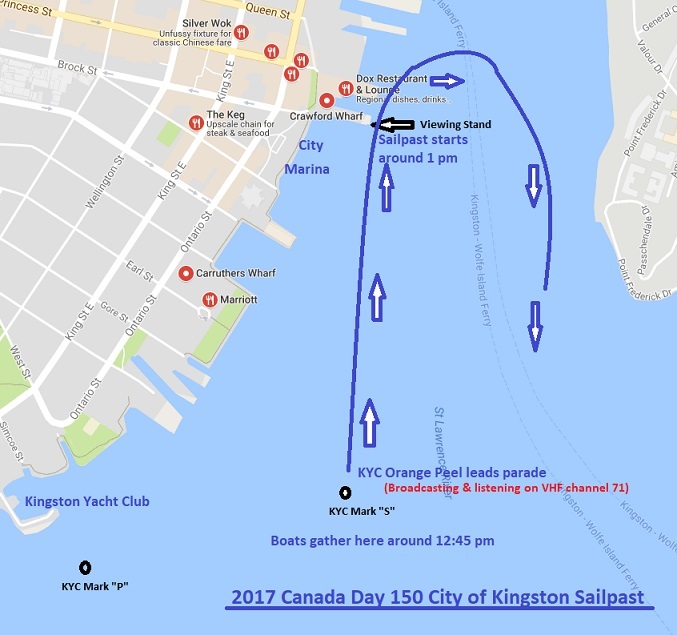 For the City of Kingston's Canada Day 150 Sailpast, boats will gather near KYC Mark "S" around 12:45 and be led by the Orange Peel past the dignitaries viewing stand at the end of Crawford Dock (just past City Marina before the Holiday Inn) around 13:00. The Orange Peel will be broadcasting & listening on VHF channel 71. IT should be an exciting day on the water with a variety of sailboats and motor craft participating! It should be an exciting day on the water with a variety of sailboats and motor craft participating! After the Sailpast, there's a BBQ at KYC from 4 - 7:30 pm, followed by the City's fireworks show later in the evening! The KYC Cruising Fleet will be gathering from all directions for a rendezvous at Waupoos Marina again this Civic Holiday Weekend. We have reserved slips for up to 16 boats and can get more space if we know in advance. There are also opportunities to camp for those of you who have jumped to an airstream or fifth wheel (you know who you are ;-) ). Our plans are for a laid back weekend enjoying each other’s company with potential for wine and/or cheese excursions. Converge on Waupoos from multiple directions. Boats will be coming from Kingston, Gunnar’s fleet of extended cruisers from Oswego, and others, including Signature, from points west. Saturday is the Shirley Homer Race for boats from various Quinte clubs and they let us join in to play last year. They will be holding their festivities under the roof on shore Saturday night and we will have a progressive supper on the dock. Progressive Supper: We will take turns visiting around the fleet for tapas as the evening advances. Everybody will get a chance to play host, and we can all get to know a little more about each other’s boats. BYOB, details to follow. A lazy day in the County. Those feeling less lazy will have the opportunity for a winery or cheese factory visit, pub lunch or whatever takes their fancy. Return to KYC. It isn’t a race. It really isn’t. 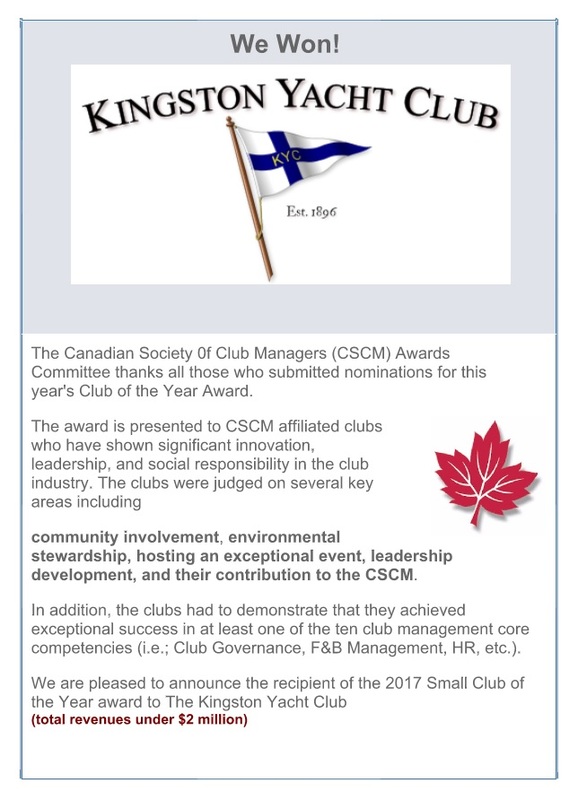 But we will assign start times for each boat in the fleet and the first one between KYC mark P and the flagpole will get some kind of bragging rights at the cruisers’ dinner next winter. If you are interested, please email Rick Sellens sellensr@gmail.com with boat name, length, beam, draft, and number of people. If you let us know your port and date of departure, we can let the rest of the fleet know who’s coming from which direction. If you have requests for the music, make sure they get to us so they can be included in the evening on Sunday. Register before July 21 to be sure of getting a slip. This week we are featuring something from Beau's that we have been tryring to get our hands on for some time! Beau’s Brewery is welcoming the long days and long evening shadows of summer with two new beers that play off each other like day and night. Called “Buenos Dias”. This beer features organic lime juice, lime and orange peel, and sea salt. Beau’s Gruit Series takes inspiration from centuries-old brewing tradition; a time before the Bavarian Purity Act of 1516 declared that all beer be made solely with barley, hops and water. In gruit ale, herbs, spices and other botanicals replace a dominant hop character, throwing the door open to experimentation. Released four times a year during solstices and equinoxes, each gruit in the series has a unique combination of ingredients and flavours. The aroma of Buenos Dias offers pronounced citrus notes, with subtle coriander undercurrents. Zippy lime flavour is accented with a wicking salt edge in the mouthfeel. The finish is quick, clean and dry. Cazal Viel Rose is a fresh and lively wine from the Languedoc-Roussillon reigon of France. Built on the ruins of ancient Roman an villa, Chateau Cazal Viel's land has a rich history of wine production stretching back as far as the year 1202 when the monks of the local Abbaye de Fontcaude used this site to cultivate their wine. Following the French Revolution in 1789 the Miquel family acquired the estate and began a family legacy of wine production that continues today. Our wine of the month has a delicate pink colour with a blend of 85% Syrah & 15% Cinsault grape, This wine has invigorating red fruit flavours with round, mellow structure and a fresh and lively finish make this a perfect rose to accompany a meal or as a refreshing beverage all on it's own. Summer Camp Classes and race teams start up this Monday July 3rd. The Junior Sailing coaching team is very excited to see everyone on Monday - We are looking forward to a great summer! 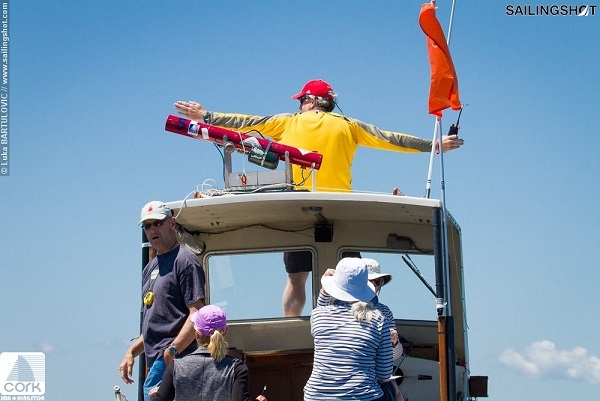 All remaining Race Committee duty slots have been assigned and skippers notified by email. The PHRF I fleet is looking for a new fleet co-captain. 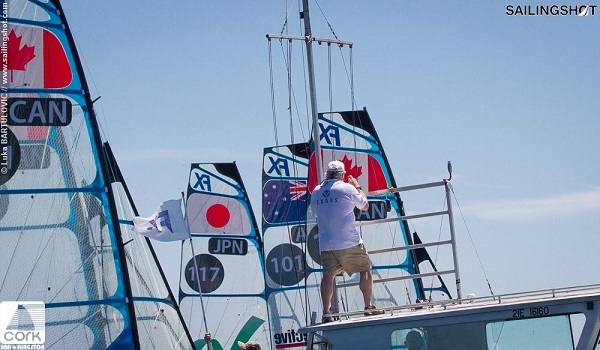 The role involves representing the fleet in club racing matters and participating in the Sailing Committee, which meets monthly. If you or someone you know might be interested in the role, please contact ken.martin@kingstonyachtclub.com. We have increasing uptake on use the raceQs app and web site. RaceQs allows us to record or race tracks for post-race viewing. See raceqs.com for details. The Community Club boats, including Jessie (a C&C 25) and Sharks are now available for racing by club members. This is a great chance for non-boat owning members to experience the wonders of racing! Thanks to Peter French, Brad and the gang for getting these boats in shape for the coming year. The 1000 Island National Parks has detailed listing of the many facility restrictions and property closures due to the high water levels we are experinecing this year. We recommend to all to review prior to heading down river (details are updated regularly for each Island). Do you have old tablets or computers that need a new home?